No one is sure when man first came to the Mojave. 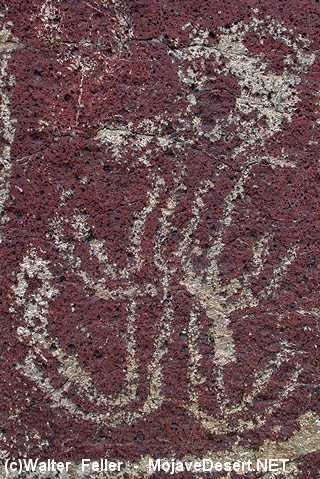 Recently, Mojave Desert petroglyphs (rock pictures) have played an important role in debates about the age of the first human occupation of the New World. New dating results show that Paleoindians may have reached this area as long as 15,500 years ago. No associated habitation sites have yet been discovered in the Mojave, however, which suggests that these prehistoric peoples moved from place to place. They lived on shores of lakes and a cool and moist climate prevailed. Streams and marshes covered the area. There was large game such as bison, mammoths and mastodons. They hunted these with spears and used darts to fish. They gathered edible plants which were also plentiful. The climate became hotter and the lakes dried up. The people migrated to places where game was more plentiful. These migrations were most likely dictated by seasonal changes, higher elevations in the summer and the warmer low elevations in the winter. Over time these human settlement patterns became increasingly organized, with more complex rituals and a subsistence reliant on seeds, plants, and farming. Shifting to a more nomadic lifestyle encouraged trade amoung various groups. Trade led to widespread use of items used for hunting and processing food. The bow and arrow, grinding tools, baskets and pottery were exchanged between these groups.